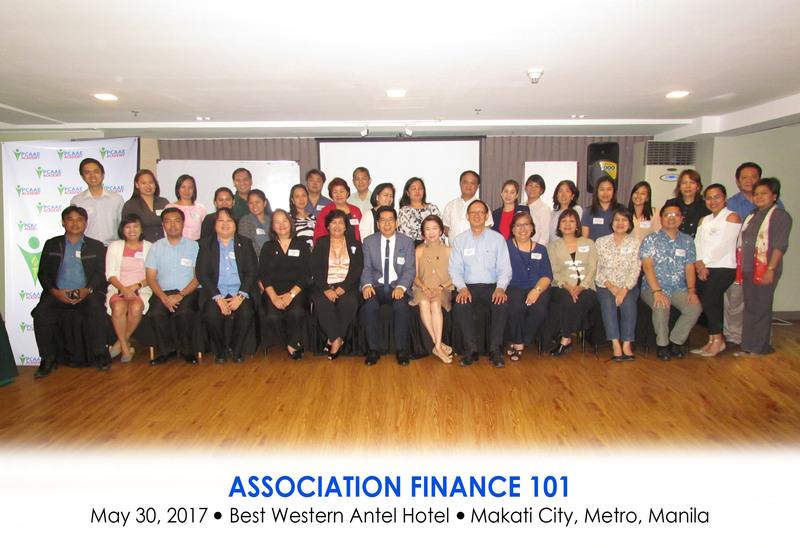 The Philippine Council of Associations and Association Executives’ (PCAAE), though its PCAAE Academy, conducted a seminar on “Association Finance” on May 30, 2017 at the Best Western Plus Antel Hotel in Makati City. The course offering, which is under the Certified Professional Association Executive (CPAE) program, was the 3rd CPAE seminar for this year and was attended by 31 PCAAE members. The CPAE program was developed by PCAAE to further professionalize association governance and management in the country and offers excellent career opportunities and growth for those already working or those considering to work in the association sector that includes Board members, officers, staff and professionals. The seminar covered four (4) learning sessions on association finance, i.e., understanding financial statements, budgeting and audit, investments, and sponsorship generation. The first topic focused on the three (3) types of financial statements such as the statement of financial position (balance sheet), statement of activities (income statement), and cash flow statement. It stressed the importance of well-prepared financial statements for the benefit of the association and for the appreciation its stakeholders, i.e., employees, funders, donors and the public. The second topic revolved around the whole aspect of budgeting and auditing process for associations that includes capital budgeting, various budgeting techniques, steps in budget preparation, types of audit, the objectives of audit and the role of associations in the audit process. The third topic covered the various types of investment instruments like money market, capital market, foreign exchange, unit trusts, and mutual funds. The fourth topic highlighted the strategies and techniques in sponsorship generation. Speakers who shared their expertise in the seminar were Atty. Bert Reyno and Ms. Carmen Cintura, Managing Principal and Finance Officer of the ADFIAP Consulting (AC), respectively; Ms. Mari Toni Bautista, Certified Treasury Professional, CFA Chartered Financial Analyst; and Ms. Evelyn Salire, Secretary General, Philippine Retailers Association (PRA).